All work and no play makes Dayna someting something. Ugh. I’m in insane project mode. If I was pregnant I would be overkill nesting. If that makes any sense. I’m so tired. I’ve started painting the inside of the house because the non-stop rain has made finishing my outdoor painting projects impossible. My friend’s Facebook status pointed out that right now Northern Alberta is on fire and Southern Alberta is flooding. Strange days indeed. I feel like we’re just waiting for the other shoe to drop though I hope that’s not the case. Knock on wood. Today I painted the guest room. It’s beautiful but the last thing I want to do right now is work on a painting. I’ve been working off and on for the past three weeks on another reflection painting, but I’m still not happy with it and it seems that I need to resolve that one before I can move on to another painting; after waiting and waiting for my flowers my garden is full of the yellow and white sweetheart tulips and I’m not painting them! 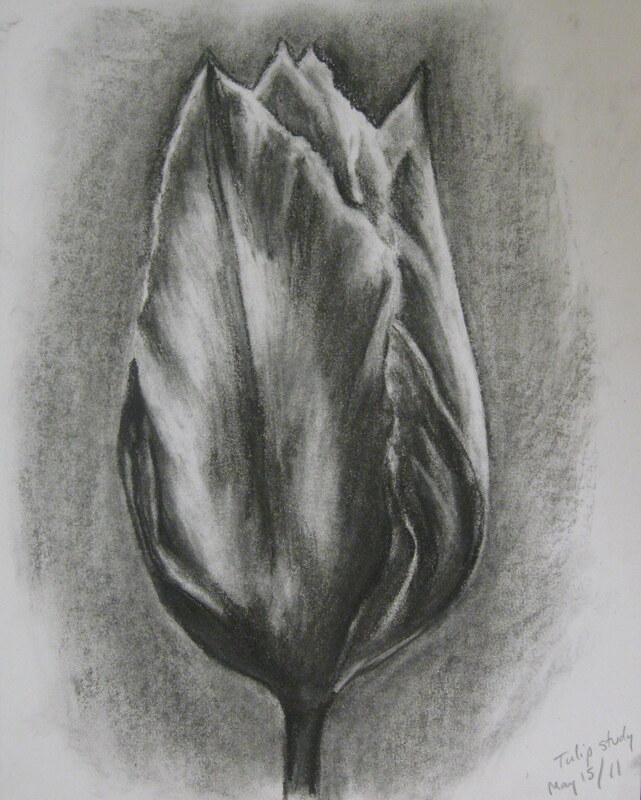 I did have some of the tulips in a vase in my kitchen and I did a charcoal study of one of them a couple of weeks ago. It’s very dramatic and it made me think that I might want to do a painting based on the study. I was also thinking of waiting and posting the sketch with the painting but here May is almost over and I’ve only done two posts this month and if I wait until everything is perfect before I post I may never post again. I just need to finish that first painting…oh and the master bedroom and the hallway…then I’ll get right on that. There’s so much to do right now. How did I ever have time to watch whole series of T.V. shows on DVD? ← (Not) Painting the Shed. Oh my Dane! Nesting overkill indeed! But you’ll get a lot of stuff done in the process! I love this charcoal study, I think it would be an awesome and dramatic painting.